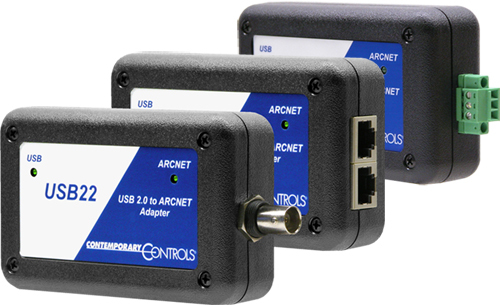 In an effort to overcome the inherent non-real-time response associated with today's traditional operating systems such as Windows®, Contemporary Controls released the USB22 Series of USB 2.0 to ARCNET adapters. ARCNET's determinism has been compromised with traditional PCMCIA interface products because typical operating systems cannot service these devices in a timely fashion, resulting in lost or missed messages. The USB22 incorporates a deep memory buffer to hold messages until the OS can service the device via its high-speed USB 2.0 connection. Using this approach, missed messages are rare-even while operating at 10 Mbps which is four times the standard ARCNET data rate of 2.5 Mbps. The Universal Serial Bus (USB) has become a well-known method for connecting either desktop or laptop computers to peripherals because it provides a very high-speed interface (up to 480 Mbps). Designed with the COM20022 controller, the USB22 represents the latest ARCNET technology-supporting data rates as high as 10 Mbps. Models exist for most recognized ARCNET physical layers. A high-performance microcontroller handles the transfer of data between ARCNET and USB. The NIM is powered from the USB port on the computer.